The Woman Who Gave a Voice to the Stolen Moon Juice Crystal Makes Balloon ArtHer newest installation is currently on display at the New York City Ballet. 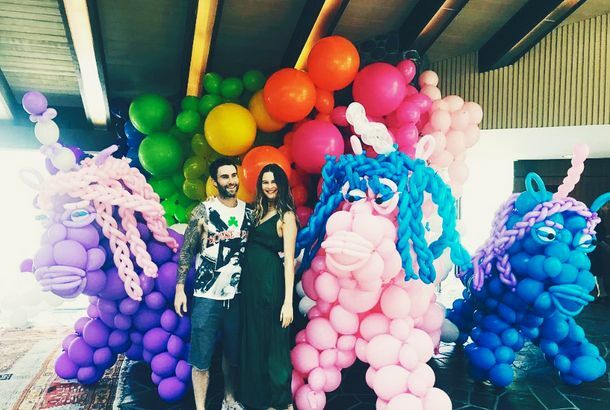 Adam Levine Celebrates His Child With Terrifying BalloonsOur eyes!!! Ariana Grande Accessorized With a Purple BalloonCheery. Watch This Guy Re-create a Keith Haring Mural Out of BalloonsMeet Robert Moy, the balloon-artist master. Potentially Crazy Guy Builds Hobbit House From BalloonsSharp objects prohibited. Watch a Rudolph Christmas Parade Balloon Meet His Untimely EndOh, the humanity. Keep a Look Out For Red Balloons TodayDARPA’s cool network challenge is going on right now. Yes, There Is a Boy in a Balloon Somewhere Over Colorado [Wait, No, There Isn’t]Falcon Heene, who was thought to be in a helium balloon thousands of feet in the air this afternoon, is still missing. Wolf Blitzer: In Touch With His Inner ChildThe ‘Situation Room’ host was overjoyed by the balloons at last night’s convention. Can’t you tell by his face?